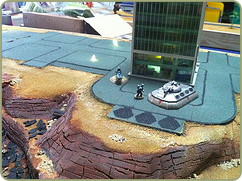 Lots of work is going into the Salute wargames show terrain layout for Gruntz. The latest update shows some lights which have been wired into the city area. Just a couple more weekends before the show, so we have lots of work to do on the super-detailing.